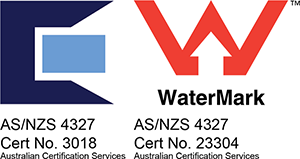 VIP-Polymers Ltd have recently obtained two accreditations for their VIPSeal® range of flexible couplings for the Australian and New Zealand Market – AS/NZS 4327:1995 CMARK (cert no. 3018) and WaterMark (cert no. 23304). The Water Services Association of Australia (WSAA), which covers metal banded flexible couplings and bushes for low pressure applications that utilise bands manufactured from 1.4401 (316) stainless steel, specifically for the infrastructure applications within the water utilities for Australasia.